…Somehow all the families of those in prisons/jails need to bind together as “one voice” about the injustices and demanding for change. The system does not work to keep marriages and families together but rather works to tear them apart further by sending them far enough away from the families that it makes greater hardships on the family members to see them…as if it’s not hard enough having them here! And- they take the food in prisons that the tax payers pay for and if the prisoners have left over food… Apple or orange or whatever…the prisons will not allow them to take them to their room to eat between meals or at night…the prisons throw it away! Now they give this food to them on the trays so why cannot they not keep and eat it? Because the prisons are a money racket! They want they to buy food from the canteen! They want you to pay the extra to put money in their accounts, extra money for phone cards to call home. Money everytime they are seen for the dentist or doctor. Many think jail/prison is free…NOT! And the burden falls upon the families!! We as the families must start a petition or something to send to Senators, Governors, the President, to contact the news or whatever it takes! We must speak as “ONE VOICE!” We need someone or people who can somehow bind the families or people together to do this. I have written the President, Governor, Senator, and Legislative person but not gotten any good response back. I write my state Senator and Legislative person frequently. We must be that “one voice” though so they will take us more seriously. Pictured above is one of eight video screens installed on the ground level of the DCDF. These will be where friends, family and loved ones see the detainee with whom they have scheduled a visit. As you can see, they will speak through a telephone receiver. Upstairs, detainees will go to the visitation room, where they will sit down at one of the windows, and, instead of see their visitor at the window in front of them, will look into a tablet-sized screen and speak into a telephone receiver. As this photo makes clear, our rallying cry—“video visitation is a glorified phone call”—is spot on. 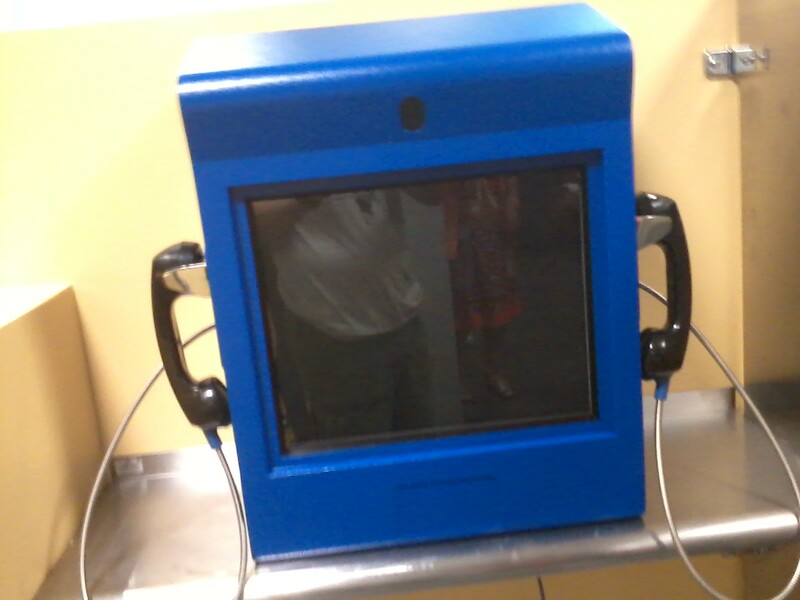 Although the Renovo (owned by GTL) online visitation scheduling system is currently allowing people to schedule video visits*, there is no word about this in the lobby at DCDF. In fact, hanging on the wall near the scheduling kiosk in the lobby, there are laminated instructions from Pay-Tel, the jail’s former telephone service provider (contract ended in June 2015). Also hanging on the lobby walls in two different places is a brochure celebrating a “Recovery Celebration” that is happening somewhere in Durham in September or happened last September (it is unclear). There is also no word about the fact that the Renovo system was “upgraded,” meaning that people with older operating systems on a home, work or public computer, or on a personal device, can no longer use the online system to schedule a visit, and therefore must schedule at the lobby kiosk. Sheriff Mike Andrews and DCSO spokesperson Tamara Gibbs have claimed that video non-visitation will make for a safer environment and will save the county money. They have made this claim without ever saying how (and media has not forced them to provide reasoning, despite the fact that it is a preposterous claim). The online scheduling system does suddenly show wording about purchasing visits, internet visits, and the possibility of video nonvisits having a cost (see screenshots below). As always, changes are made and detainees and their families are not informed about them. The station pictured here, and the seven alongside of it, are undoubtedly objects worthy of our unmitigated wrath and fury. In the great and long tradition of Ned Ludd, these machines should be summarily and swiftly smashed to bits or simply pulled out of their docking stations and trashed. But, even if that is done, we must remember, it is not the machines that are really the problem, nor are they the most suitable targets of our wrath. Rather, it is what the machines represent: a belief on the part of those in power that they can justify the increasing degradation of detainees and prisoners and their loved ones. Andrews, who never shows his face, and instead sends his lackey, Paul Martin; Couch, the interim detention director and so-called head of security; and the county commissioners, especially those who approved the video visitation plan (Wendy Jacobs, Brenda Howerton, Ellen Reckhow). They must be held accountable.